Full Body Bulldog Patch 4"
Full Body Bulldog Patch 6"
Full Face Cardinal Patch 4"
Full Face Cardinal Patch 6"
Eagle In Flight Patch 4"
Eagle In Flight Patch 6"
Knight on Horse Patch 4"
Knight on Horse Patch 6"
Give your students something to be proud of with our custom-made chenille mascot patches! Our collection of patches is the perfect way to proudly display school pride and traditions to recognize participation in any activity, sport or organization. Choose from a variety of traditional mascots, ranging from lions to tigers, eagles tocardinals, and trojans to knights, among others. No matter what you select, our custom patches will beautifully display student participation and achievement. Don't see the mascot patch you had in mind? We're happy to work with you to create a new mascot patch that's 100% custom for your school. Or, try our state patches andshape and panel patches, which also serve as great ways to recognize any school accomplishment. Just choose a state or shape and add mascot or sport inserts to portray hard-earned accolades! Take a look at our full collection of chenille jacket patches. Our shape and panel jacket patches serve as blank canvases for any and all student accomplishments. Just choose from circle, star, shield or ID panel patches, among others, and add your text with musical, academic or mascot inserts to display any type of student achievement. 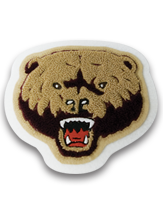 Check out our chenille sport patches, which feature all of your favorite school sports. Choose from a huge variety of chenille patches that includes baseball sport patches, football sport patches, weightlifting sport patches, track sport patches, cheerleading sport patches, volleyball sport patches, basketball sport patches, among others. No matter what you select, our custom jacket patches will beautifully display student athlete participation and achievement. Give your students something to be proud of with our custom-made chenille band and music patches! Neff's chenille band and music shape patches, feature music jacket patches like lyres and eighth notes, fine arts jacket patches like drama and ballet, and activity jacket patches like crossed flags, among others. Our collection is the perfect way to proudly display musical achievements for every level of student participation and each type of activity. Put yourself on the map with chenille state patches to honor tournament appearances, successful seasons and state titles or championships in your home location. State jacket patches are cut in the shape of your state and can be personalized with your choice of felt, chenille colors, text and sport or mascot swiss inserts. Our numbers, positions and weight classes jacket patches are yet another way for your students to customize their varsity jackets from top to bottom! Give your students the opportunity to proudly display their athletic position, weight classes, or player numbers—the options are endless! With these custom jacket patches that allow you to create connected numbers and letters of any kind, your students' varsity jackets can be completely customized and personal. Your students' varsity jackets will be sure to make an impact with chenille graduation year patches! Proudly displaying graduation year, with our two digit graduation year jacket patches, jacket patches with tails, and block graduation years. These beautiful script chenille jacket patches are as personlized as you get! And with our online builder, you can see a virtual preview of nearly any name or text you want to display on your varsity jacket. Our script chenille patches are available in 2" script chenille, 3" script chenille and 4" script chenille sizes, and with our without a tail below the text. Add swiss inserts to script patches with tails for a completely personalized design. Recognize scholastic achievements with our timeless collection of academic patches, featuring an array of scholarly designs, including torches, lamps and scrolls. Add your scholastic achievements or school name to your academic jacket patches for a unique design. Recognize individual participation, varsity lettermen and exemplary achievements with traditional chenille numerals, stars, bars and chevrons. Our collection of numerals, stars, bars & chevrons are as classic as you can get. If tradition and pride run deep in your school, honor your history with our custom-made numerals, stars, bars & chevrons! Does your school's name have more than one letter? We are proud to offer the highest-quality chenille monograms, which are available in 2", 3" and 4" letter styles. Choose from any of our chenille lettering styles for your chenille monogram and add custom chenille colors, felt and inserts. At Neff, we've been specializing in the chenille patch business for the past 65 years, and we take pride in providing you custom chenille jacket patches to meet your needs. That's why all of our chenille jacket patches are available in a variety of sizes and colors and can be completely customized to suit not only your school, but each individual student as well. Give us a call if you don't see what you're looking for, we'd be glad to create a custom chenille patch just for you. View our full collection of school awards! Can't find your School Mascot Patch? We can make any school mascot with guaranteed color matching. Take a look at some of our recent customer designs!